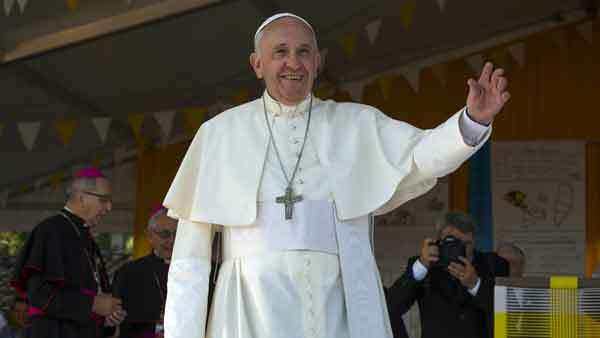 ASUNCION, Paraguay -- Pope Francis reinforced his place as spokesman for the world's disenfranchised Sunday by visiting a flood-prone slum to encourage its landless and insisting the Catholic Church be a place of welcome for all - sick and sinners especially. Francis ended his South American pilgrimage with a huge Mass and words of hope and faith for young and old. But the political, anti-capitalist message he left behind may have a more lasting punch. "How much pain can be soothed, how much despair can be allayed in a place where we feel at home!" Francis said. Then he outlined his vision of the church: "Welcoming those who do not think as we do, who do not have faith or who have lost it. Welcoming the persecuted, the unemployed. Welcoming the different cultures, of which our Earth is so richly blessed. Welcoming sinners." The stage for the Mass was a remarkable sight: A huge triptych with the pope's Jesuit insignia over the central altar, flanked by images of his namesake, St. Francis of Assisi, on one side and the founder of his Jesuit religious order, St. Ignatius Loyola, on the other. The entire structure was a mosaic, an ode to the role Jesuit missionaries had in Paraguay, made out of 40,000 ears of corn, 200,000 coconuts, 1,000 squash gourds and many, many dried beans. Artist Koki Ruiz told The Associated Press earlier in the week that the scene was an "homage to the ancient Guarani aborigines who respected Mother Earth." Francis has emphasized care for creation and its most oppressed people during his tour of Ecuador, Bolivia and Paraguay. He drew cheers when he arrived at the start of the day in the Banado Norte shantytown on the banks of the River Paraguay saying he couldn't have left Paraguay without visiting, "without being on your land." Many residents of Banado Norte are squatters on municipal land who have come from rural areas in the northeastern part of the country where farmland has been increasingly bought up by Brazilians and multinational companies. Residents argue they should be given title to the land because they have worked to make it habitable with little help from the city. "We built our neighborhoods piece by piece, we made them livable despite the difficulties of the terrain, the rising of the river and despite public authorities who either ignored us or were hostile to us," resident Maria Garcia told the pope. Francis said he wanted to visit the neighborhood of shacks of plywood and corrugated metal to encourage the residents' faith despite the difficulties they encounter. In addition to the lack of services, heavy rains regularly burst the Paraguay River banks and turn Banado Norte's dirt roads into impassable pools of mud. "Now I can die peacefully," said Francisca de Chamorra, an 82-year-old widow who moved to the slum in 1952. "It's a miracle that a pope has come to this muddy place." Francis left a final message before he left: Stir things up, but then take responsibility for what you have done. It was a modification of his famous exhortation in 2013, when in Rio de Janeiro he told a church full of Argentine youths that he wanted them to "stir things up" in their dioceses by going out to the peripheries. Francis told tens of thousands of young people gathered in Paraguay's capital Sunday that a fellow priest once told him that encouraging youths to disrupt things was all good and well, but that later others had to clean up after them. So Francis said he was correcting himself. "The mess that young people make, we then have to clean it up ourselves!" he said to roars of laughter. "Shake things up, but then clean it up and fix the mess that you've made."